I’ve had a crush on YA fiction for decades. Young adult fiction is bold. Raw. Real. YA is like your trendy cousin who has a daith piercing and a neon blue streak in her hair. The genre is studded with books willing to push the stylistic envelope: bold prose, present tense, novels in verse, books written all in text messages, and other experimental styles less likely to be seen in the more buttoned-up adult fiction section. I love writing YA because of the creative risk-taking in the prose, but even more so, I love how the stories straddle that exhilarating period of time between childhood and adulthood when the characters are discovering and shaping their futures. Some people hear monikers like “young adult” or “teen fiction” and think sanitized, safe, or sweet, but some of the most life-changing books I’ve read in my life were from the young adult section. The protagonists in YA fiction are carving out their identities and discovering the truth about many uncomfortable topics—sexual ethics, racial discrimination, religious bigotry, hate, grief, love. They’re figuring out for themselves what they believe about good and bad, right and wrong, and that’s a powerful place to explore. When I think of most of the books that challenged my thinking, changed my perspective, or forced me to confront my own biases, YA titles dominate the list. Speak and Winter Girls by Laurie Halse Anderson. Finnikin of the Rock by Melina Marchetta. Hate List by Jennifer Brown. Fan Girl and Eleanor & Park by Rainbow Rowell. If I Stay and Where She Went by Gayle Forman. The Hunger Games by Suzanne Collins. And on and on. I’m thirty, but I can remember vividly that awakening to the shape of my own self, the pushing of my mind against the limits of what I’d been taught as I struggled to make sense of the world around me and all the conflicting beliefs and convictions existing within it. There’s something fierce about young adulthood—both a sense of urgency and a horizon of possibilities. The decisions I made and the person I became formed the hinge upon which my future turned. Thinking about it still gives me a pang in the pit of my stomach like I’m at the top of a rollercoaster. And that is why I love—and write—YA. Craig and his buddies imprison Sam and Victoria in an abandoned mountain cabin to await ransom. Putting aside mistrust for tentative friendship, Victoria and Sam form an unexpected bond. They conspire to escape together, and the close quarters ignite a startling attraction between them. Then, they discover strange tunnels beneath the cabin. And what they find inside the tunnels proves more bizarre. Kate Avery Ellison loves putting a dash of mystery in everything she writes as an ode to her childhood spent reading Nancy Drew, Agatha Christie, and Sherlock Holmes. She wishes she could live in a place where it’s always October, but until that’s possible, Kate makes her home in Atlanta with her husband, son, and two cats. 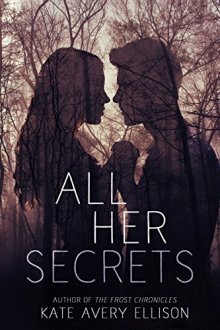 Her latest novel, ALL HER SECRETS, is a YA psychological thriller about a kidnapped girl who must trust one of her abductors to escape.